Pinkies Up! - Come Sail with Me! Ahoy! 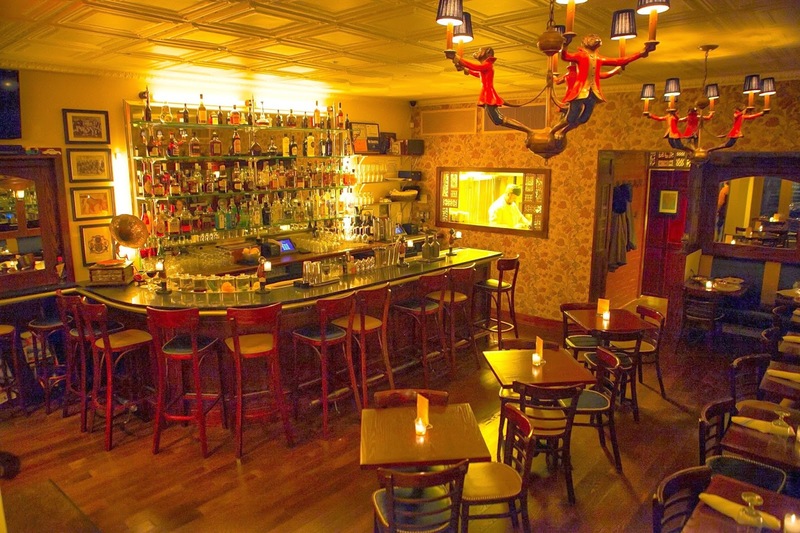 The Anchor bar is aptly titled as it indeed has been firmly anchored in Soho for over six years now. Savvy nightlife folks Gunther Bilali and Jason LaGarenne are the smooth operators, offering up a revolving roster of punch bowls that really pack a wallop! Look to vodka-based Spring St. Punch, the Anchor Power Punch with high octane rum, and perhaps for something a little kinder, the Sea Shanty Punch with fizzes of Champagne. I think however that the Murricane, named after regular Bill Murray, is requisite. Sail away to The Anchor or set a course for adventure and make it at home! Combine the watermelon and basil leaves in a mixing glass or shaker and muddle. Fill the shaker with ice, add the bourbon, lemon juice and St-Germain, and shake with vigor. Strain into a highball glass and garnish with freshly cracked black pepper and a juicy watermelon wedge. And here's a pic of the punch--all aboard! The Anchor is located at 310 Spring St (b’twn Hudson/Greenwich Sts) in New York City. TheAnchorNYC.com. What's going on in and about town! 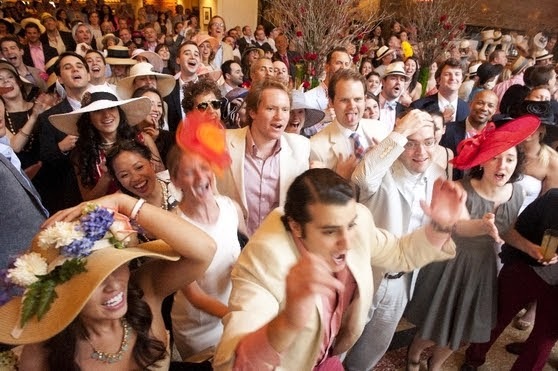 Grab a smart jacket, get your fancy hat, leaves your troubles on the doorstep and head to Eleven Madison Park as they host their 6th annual Kentucky Derby Party on Saturday, May 3rd. The most exciting two minutes in sports and one of my favorite days of the year! This year, the Park has partnered with Esquire magazine, Woodford Reserve and Nat Sherman among others as they all partake of some mint julep tippling, Derby dishes and live music. Go to MadeNiceNYC.com/events for tickets immediately—I’ll wager they go fast. Pinkies up! 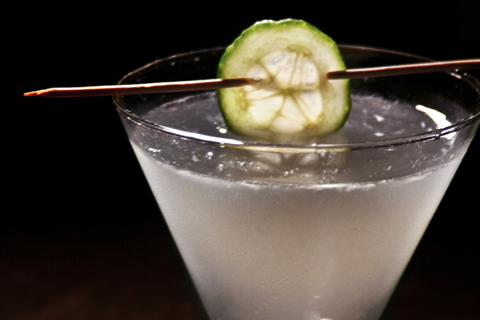 From May 9th- 13th, the fifth anniversary Manhattan Cocktail Classic will get thing shaken in Manhattan. High spirits with prevail over five days in three boroughs. Apart from all the boozing there will also be educational seminars and pig roasts, lunch and dinner travails and a cocktail party at the New York Public Library. Please knock it back with kind consideration for others and heed these words of wisdom: behave and keep your legs crossed. Get your tickets at ManhattanCocktailClassic.com. Entrepreneur Miki Agrawal (WILD, THINX) has partnered with fellow restaurateur Walid Hammami (former owner of Café Rafaella, Angelina and Atlas Cafés) and together they are set to open a new farmhouse-chic location of her gluten-free pizza and Italian specialties restaurant concept at WILD in Williamsburg to form a triptych with the other locations in Manhattan’s West Village and Las Vegas, which are already serving healthy and farm fresh fare. Forage for black quinoa and kale salads as well as spinach and artichoke pizzas, comforting gluten-free pastas dressed a la vodka, and wild chicken Parmesan entrées. Don’t forget about the homemade, vegan kale cupcakes for dessert. So stick a fork in it! WILD is located at 340 Bedford Ave, 347-599-0699, EatDrinkWild.com. You must believe in spring! To help kick off the season, Manon announced their after work special and bar menu. What a lark to receive 30% off all beverages from 5:00pm - 8:00pm daily at the gorgeous main bar! The whole multi-leveled space is an absolute enchantment and the new food menu includes smoked duck on buckwheat, bar crudite, blue cheese and white chocolate crab cakes (imagine? ), braised pork sliders and a duo of beets. 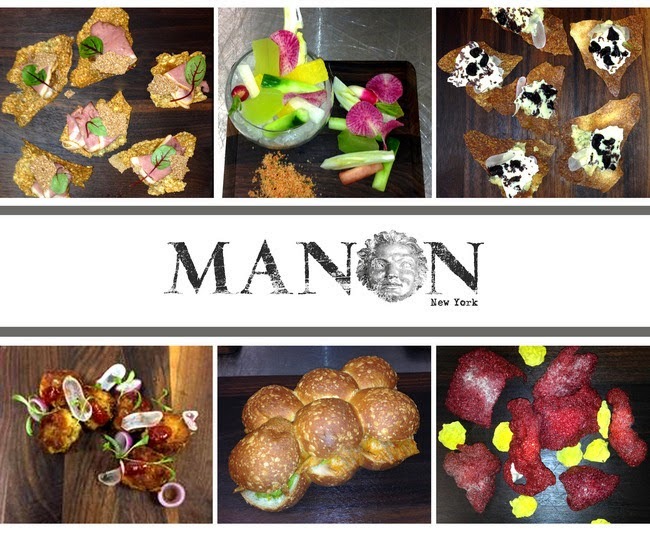 Manon is located at 407 W 14th St, New York, NY, 212-596, 7255, Manon-NYC.com. Now, despite the fact that spring hardly has sprung, Easter will still be hopping along soon (April 20th to be exact). Ken & Cook has an appropriate basket filled with a prix fixe for Easter Sunday. The three course menu will include an appetizer, pasta or entree and dessert for $45 per person—and live jazz! Expect such things as earthy beets, homemade ricotta, radishes, pistachios, lobster ravioli with asparagus sauce, wild mushroom risotto, sauteed wild mushrooms with truffle oil to flood the table with a final flourish of vanilla creme brulee. Ken & Cook is located at 19 Kenmare St, New York, NY, 212-966-3058, KenAndCook.com. 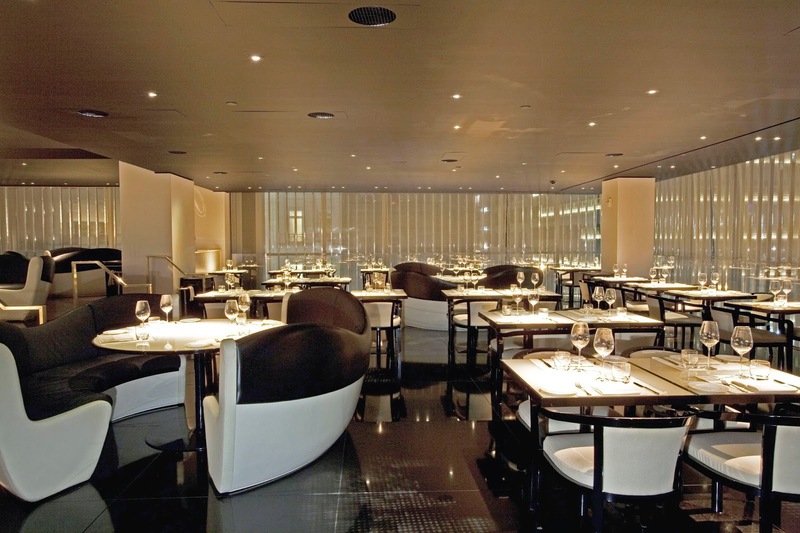 The Orale MK concept was the mind-child of NYC restaurateurs Alex Mendelsohn and Louis Alvarez. And now, with Beyond Restaurants Group, Cristina Castañeda is on board to translate the former Café Frida space into a new Mexican spot on the Upper West Side. Orale Mexican Kitchen brings Mexican-inspired cuisine to a hipster scene alongside agave-based cocktails. Try the trio of guacamole among signature dishes, as well as bocadillo bites, tacos and a range of platos principales. We look forward to the Mexican Mac & Cheese! 60 seats are most accommodating and a 30-seat courtyard patio is soon to open as well—do you get the sense I can’t wait for spring? Orale Mexican Kitchen is located at 768 Amsterdam Ave, New York, NY, 212-749-2929, OraleMK.com. The owners of Surya (sadly closed) present Savoury, a new modern Indian restaurant opening March 26th that also happens to be on Manhattan’s Upper West Side. 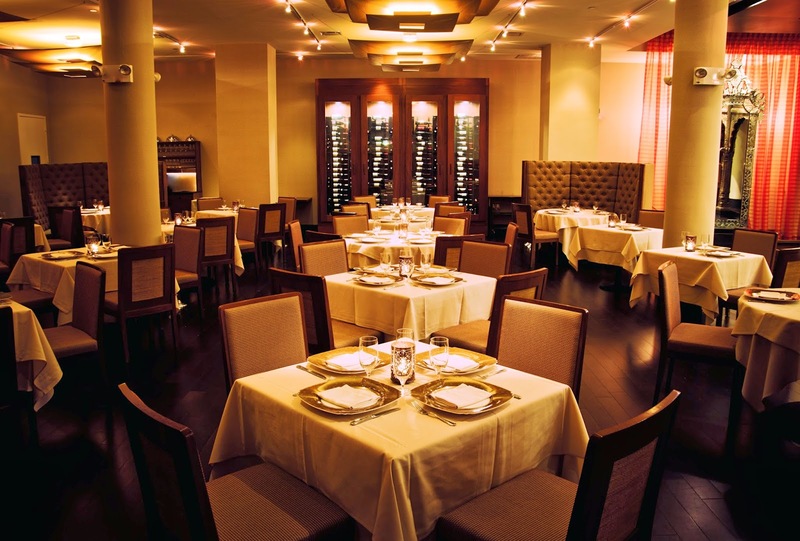 Chef/owner Lala Sharma’s cooking is influenced by Western and Southern Indian cooking with the fragrant aroma of spices floating over the intimate lounge, cocktail bar and dining room. Appetizers include warm sprouted lentils tossed with rice puffs with mustard seeds and fried curry leaves and crispy cauliflower in garlic tomato sauce. Yogurt-marinated baby lamb chops, scallops in tamarind-coconut sauce, vegetarian cooking and tandoor cuisine are also among the house specialties. Of course there are requisite biryani rice dishes and crispy, puffy breads such as garlic naan. Why not sip on a lime-green Tandoori Sour with Strawberry Stoli, Midori and sour mix while at it? 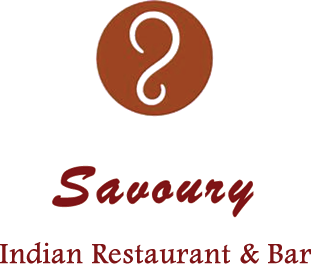 Savoury is located at 489 Columbus Ave, 212-875-1400, SavouryNYC.com. Our neighbors are moving only across town but I'm still fairly devastated. In all the years I've lived in New York, I've never been so close to folks down the hall where we have each other over to our respective apartments for dinner constantly, rap on our doors just to say hi (or return borrowed plates and glasses!) or go out to dinner together and eat, eat, eat! Needless to say it was requisite to give them a proper send-off so I composed a dinner reflecting both of their backgrounds. G is from Mexico City (with a touch of French) and S is British. My thoughts simmered as I wondered how to combine the two influences while setting the table a day in advance. Don't you love the Cherry Brandy rose bouquet? I began to assemble a simple relish tray in my mind composed of sausages, pickles and bleu cheese we had on hand to get things started. Baby helped me roll up these adorable napkin nests from Perfect Table Settings by Denise Vivaldo. Naturally we placed carved wooden birds on them. Pork Pies from the British import shop Myers of Keswick in the heart of the West Village were a must as the anchor for dinner, both standard and pungent Stilton-stuffed varieties. Goya Spanish yellow saffron rice was a wonderful side. I added in sliced chorizo sauteed in Bonne Maman apricot preserves (I thought of it as a nod to classic British apricot and lamb pie). Heinz baked beans in tomato sauce was out of the can and also from Myers of Keswick. Noting G's French heritage, I also made Green Beans Almondine! S & G also brought over a sizable Pandoro via Pasticceria Perbellini Ernesto in Bovolone, Italy--sort of a spongy bread-like cake with essences of rum, orange and vanilla. It was perfect to go with our Haagen-Dazs dulce de leche ice cream and British Curly Wurly candy bars! Farewell, dear friends. Although you will not be across the hall from Baby and me, you will always be in our hearts--and we'll see you back here soon and now, across town! Sountrack: Fun personal party mix with Blondie, The B-52's, Hugo Montenegro, R.E.M. and Henry Mancini! I loved my evening spent at Armani/Risorante Fifth Avenue when I reviewed it and am even more pleased to be able to make this recipe at home! 2 cup Parmigiano cheese, grated (divide into 4 portions). 1) Mix together flour and egg yolks and knead into a dough. Leave to rest in the refrigerator. 4) Place eggplant and tomato on separate parchment papered baking sheets, brush with garlic oil and season with salt and pepper, thyme leaves. 6) Roll out very thin sheets (1/16-inch thick) of dough, use a mold to cut sixteen 4-inch rounds of dough. (4 per lasagnetta x 4 portions = 16). 7) Quickly blanch rounds of dough in salted boiling water (approximately 10 seconds), then cool in iced water to stop the cooking process. Place them on a paper towel to dry. 8) Once dry. Place four rounds on a oiled baking pan. Begin layering tomato, eggplant, a spoonful of tomato sauce, grated scamorza cheese, julienned basil, a pinch of dried oregano, and a teaspoon of beschamel sauce. Repeat three times, (to make a total of four layers on each lasagnetta), topping the final round of dough with grated parmigiano cheese. 9) Bake in oven at 350*F for approximately 15 minutes. 10) Meanwhile, prepare the sauce: boil heavy cream until reduced by half, then add the remaining parmigiano cheese, stirring continuously until dissolved. 11) Divide and spoon the sauce evenly on the center of 4 pre-heated flat plates. 12) Remove lasagnetta from the oven, using a spatula, move each lasagnetta to the center of the plate, in the center of the sauce. 13) Serve immediately while hot. A trip to exotic locales—right in Manhattan! Junoon (27 W 24th St, 212-490-2100, JunoonNYC.com) presents a perfumed excursion through a modern Indian spice market with a hefty price tag. Do attempt the Tandoori Tequila concoction featuring mashed tropical pineapple, curry leaf redolent of damp earth and insinuating pippali pepper poured over crushed ice. Go for crispy slices of baby eggplant chaat with chopped red onion and tamarind to begin. Aloo paratha crepes with a thin layer of mashed potatoes and cilantro are a fine accompaniment to daal makhni, a gingery dish of black lentils, red kidney beans, split chick peas and lots of clarified butter. Coconut rice pudding with bruléed bananas is a must try. Take off your shoes (mandatory), submerge yourself in the floor and settle into some fine, elevated vegetarian Korean food at the very Zen-like little cavern Hangawi (12 E 32nd St, 212-213-0077, HangawiRestaurant.com). The avocado stone bowl rice is fairly essential; the avocado bending beneath the fork to create a sumptuous mash, mixed with vegetables and tofu over rice dressed in a miso sauce—served in an actual stone bowl! Check out hot pot lunch specials or the Emperor’s Tasting Prix Fix with four dinner courses. There’s a gluten-free menu too. Whatever your path, you still have to remove your shoes. Sharing plates and serious cocktails fill the “dining car” at Orient Express (325 W 11th St, 212-691-8845, OrientExpressNYC.com) with the lure of exotic train travel from yesteryear and the swinging sounds of Ellington, Porter and the Gershwins floating over the sound system. The signature drink list summons up tales of espionage, suspense and murder at the hands of Agatha Christie and James Bond, with a cognac-laced Leopold, a gin-based The Agatha and a vodka-fueled From Russia With Love as blinding evidence. The staff may serve with simmering indifference, but try the tarama plate of rich red roe with briny Kalamata olives and fruity olive oil or the thinly sliced Turkish cured beef with wonderful fresh oranges and a pomegranate-balsamic drizzle. Bento box-sized Hakata Ton Ton (61 Grove St, 212-242-3699, TonTonNYC.com) has a whole lot of Japan going on. 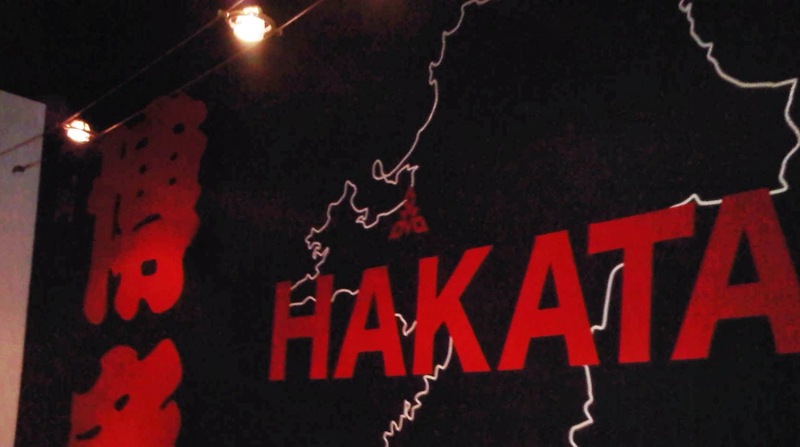 Simmering, at first unnamable aromas wafting about reveal garlic fried rice with pork and Hakata’s motsu hot pot with a stunning broth flavored by Kobe beef motsu, otherwise known as…intestines! 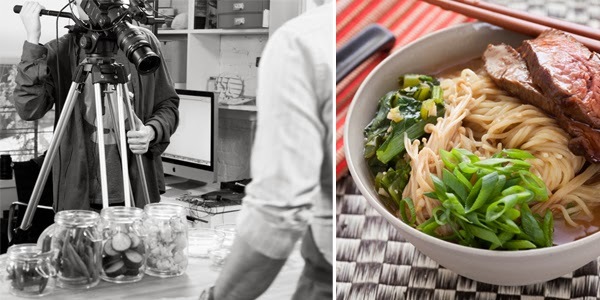 Sesame chanpon noodles are a requisite accompaniment. Lotus Blue (110 Reade St, 212-267-3777, LotusBlueBar.com) offers flavors of the Yunnan region (sandwiched somewhere in between Tibet, Vietnam and Burma) found in its verdant forests and ponderous streams. Now, for a trip to this transporting TriBeCa cuisine, go for the Melon Breeze (shown), a Perfumed Basil Affair cocktail, a salad of chrysanthemum greens, bamboo pith mushroom soup and chicken cold noodles. Do enjoy all of it in the inviting room that is warm and glowing, with suspended, tasseled lamps, the color of lychees. 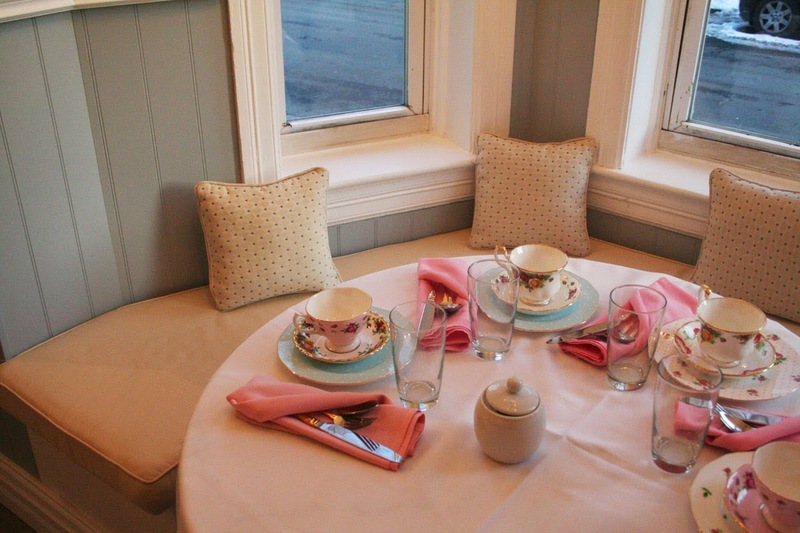 This just in from WTOP.com in Washington, D.C.: A friend wrote to me about Lady Camellia Pastry Tea Room (pictured), a soothing respite for a spot of tea in a cozy room. Peachy pink hues lend a sense of Old English and New French sensibilities with tables set in elegantly floral gold-rimmed white porcelain. Feel free to take an afternoon tea! Look for imported loose leaf teas (including fruit teas) to sip while chewing over a scone. Thanks for the news courtesy of Rohan Williamson, special to WTOP.com. Lady Camellia is located at 3261 Prospect St in Georgetown. For reservations and more info, go to LadyCamellia.com. Follow @WTOP on Twitter and on the WTOP Facebook page. Attention all vegans, vegetarians and well, everybody else! The HappyCow Cookbook (Get it? Our beaming bovine buddies are getting a break) to be released in June will lead you to vegan and vegetarian cuisine from dining spots all around the world. Eric Brent, creator of HappyCow and Glen Merzer, co-author of Food Over Medicine have compiled mindful recipes such as the Buddha Lentil Burger from Buddha Burgers in Tel Aviv (BuddhaBurgers.co.il); the Wild Forest fried mushroom concoction with jalapeno mashed potatoes from Plant in Asheville, N.C. (PlantIsFood.com); Pumpkin Noodle Salad from 222 Veggie Vegan (222.veggievegan.com) in London; and Gluten-Free Coconut Strawberry Shortcake Cupcakes from Chaco Canyon in Seattle (ChacoCanyonCafe.com). For more information, go to HappyCow.net; check out their page on facebook.com/Happy Cow; tweet away on twitter @Happy Cow. Get out your beads again and support your foodie street vendors! The New Orleans Vendy Awards will take place on Thursday, April 3rd at NOLA’s historic French Market. For more info and tickets, go to VendyAwards.StreetVendor.org. There’s still time to celebrate March Madness at recently opened Pop @ Pod in East Midtown Manhattan. Represent your favorite teams by sporting some sportswear and score with the restaurant's after work "Superman Combo," available during the March Madness period, starting after 5pm. 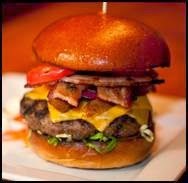 The special includes The Superman (a "game-day" burger loaded with bacon, fried pickles and grilled onions), an order of fries, and chuggable draft beers for a 20 bucks. Reserving your own booth with individual flat-screen is also an option. Rah rah rah! Pop @ Pod is located at 230 E 51st St, New York, NY, 646-277-2900. Visit them at PopAtPod.com, also seen below. My mother has a penchant for tea and recently hosted a tea party where a bunch of her girlfriends brought a treat to accompany the steaming porcelain cups over a genteel afternoon. 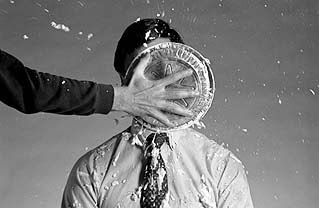 I was rather excited to learn about a particular custard pie that her dear friend brought. Doesn’t that sound just delicious? She sent me the recipe recently—so without further ado, do enjoy Jane Carrier’s Custard Pie! Thanks Mom and Jane! 7. Bake and check after 25 minutes. Custard should be set by 30 minutes at most. Thanks too to NappyValleyNet.com for the fun photo! Quick Eats: Manhattan with Bulleit bourbon; cauliflower soup; roasted chicken; bread pudding. Living in the far side of Manhattan’s Chelsea (or the West Chelsea Corridor, as some call it), I often feel when I go to more centralized locations that I’m going "into town." And recently, I went into County, situated in the Flatiron District. 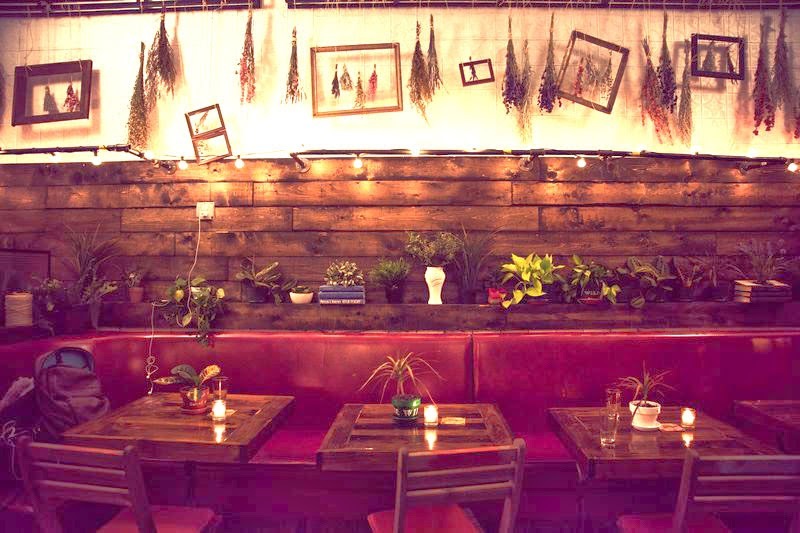 The marvelous set-up configured warm, repurposed wood from upstate New York on the walls and ceiling to set a comforting tone surrounding the garrulous, mostly young crowd. I was as cold as a well-digger’s nether regions when I entered but a Manhattan, straight up with Bulleit bourbon and garnished with a brandied cherry remedied that effectively, as delivered by our sweetheart waitress, Hannah. My dining companion opted for another region, the Vodka East Side, just like candy while still packing a punch. Mint and cucumber made a great combo and anticipated spring—this is also available with a dose of devilish absinthe, to be knocked back at your own risk! Charred edamame (with a glaze more spicy than sweet) was indeed too spicy for me but I warmed up to a warming, delicious cup of cauliflower soup, which was just the ticket for the evening, with roasted walnuts, a swirl of chili oil and cubes of slightly pungent raclette cheese. Creamy ricotta cheese with grilled country bread was great, served with a honey drizzle, mint and an admonishing bite from red chilis. What then after soup? Why, salads of course, for our next course! Kale arrived, dressed with a very fragrant garlic-lemon vinaigrette, nostril-tickling grana padano cheese and minute brioche croutons. More salad featuring julienne green apples, bibb lettuce and spiced walnuts in a Parmesan vinaigrette was also a delight. Al dente cavatelli became our pasta course, so hearty and filling, outfitted with tasty nubbins of pork in the ragu, braised kale, a button of ricotta, a peck of Pecorino and a springy step of lemon. I tend to avoid chicken at restaurants and veer toward the more adventurous, but the roasted chicken clucked at us and was just ducky (you may imagine a sly wink emoticon here if you wish), part roasted and part fried to crispy golden brown perfection. Accompanied by a fiery side of collard greens and delectable, dreamy, cloud-like mashed potatoes. Short ribs were certainly big chunks of meat, delicately balanced by a salad with refreshing mint and sensually pink supremed grapefruit. A side of Brussels sprouts in a creamy vinaigrette rounded out the meal. We flipped over the heavenly bourbon bread pudding draped with buttery caramel and devoured it hastily. I’m not sure which county County refers to but we want to be part of that district! Tablao (pictured), a tapas restaurant in Tribeca recently opened, is helmed by Spanish industry vets Frank Castro (former GM of Son Cubano) and his father, Executive Chef Francisco Castro (Toledo). Look for Montaditos, or tapas “mounted” on toasted bread, with such tempties as Chorizo y Huevo (chorizo and fried quail eggs) or little bites like Solomillo, filet mignon sautéed with cherry peppers in Rioja red wine. Traditional entrees such as Paella, and house specialties such as Pollo Tablao, grilled chicken breast with jumbo shrimp are available as well. There are also live Flamenco shows twice a week! 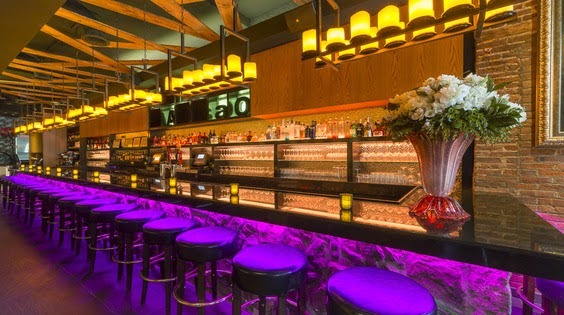 Tablao is located at 361 Greenwich St, 212-334-4043, TablaoNYC.com. In other Tribeca news, celebrate the 20th Annual Taste of Tribeca on Saturday, May 17, 2014 from 11:30am to 3pm. The outdoor culinary festival features local flavors from folks in downtown Manhattan. 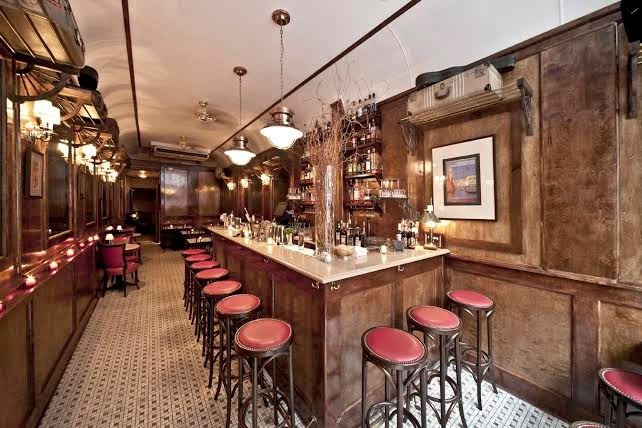 Look for mainstays Bouley, Tribeca Grill and Walker’s in attendance and other newcomers. In addition to restaurant tastings, there will be a special VIP section, live entertainment, wine tastings and scads of other fun things. All proceeds will ensure the continuation of arts and enrichment programs at local public schools, PS 150 and PS 234. Visit TasteOfTribeca.org for tickets and more info, follow the event: @TasteofTribeca #tasteoftribeca #tot2014. So raise a glass and toast Taste of Tribeca—and naturally, bring your eatin’ pants! Custom Fuel Pizza & Salads opened last month in Harlem, backed by sporty players former Knicks men John Starks and Anthony Mason, Syracuse basketball coach Jim Boeheim, and CNN news correspondent Chris Cuomo. Jeremy Wladis of New York’s The Restaurant Group (A.G. Kitchen, Amigos, Good Enough to Eat) and Zach Current, founder of North Carolina based Fuel Pizza man the court as well. Start with a white, whole wheat, or gluten free 7x13 inch crust, choose any sauce, cheese and up to four toppings from 40 choices, including burrata cheese, grilled artichoke, and farm egg from locally sourced ingredients and other purveyors. Then into the oven it goes and comes back out in about 90 seconds! Other suggested pizzas include basil and artichoke and BBQ chicken options. In addition to the New York City location, Custom Fuel has two locations in Washington, D.C. 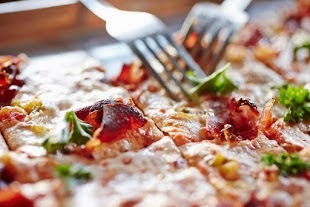 Custom Fuel Pizza & Salads is located at 2288 Frederick Douglass Boulevard, 646-524-5636, CustomFuelPizza.com. Five years ago, I started my blog with the introduction of a cassoulet recipe. So here we are again with my anniversary cassoulet, a marvelous hearty mix of duck, duck sausage and white beans! Saveur magazine came through with a fabulous recipe that I had never tried for a different cassoulet in celebration. Japanese panko bread crumbs stepped in for regular bread crumbs--and I did not make my own duck confit although I have created a fantastic shortcut that I find to be as good as any other recipe, with the benefit naturally of being less time consuming (instructions found here alongside a harrowing dinner tale!). The process began on Monday evening and the meal rested in the refrigerator for two days. The Le Creuset cast-iron cassoulet dish was brought to room temperature and shortly before our guests arrived, the dish was heated up while the duck was sliced thinly and then baked with it. Bottles of rich, robust Cotes Du Rhone reds were absolutely perfect to consume with our cassoulet--and dried antique hydrangeas, a vase of white roses perched atop an illumined vintage cake stand flanked by brass candlesticks with white candles made for a stunning centerpiece. Cassoulet au Canard--White Bean and Duck Casserole! 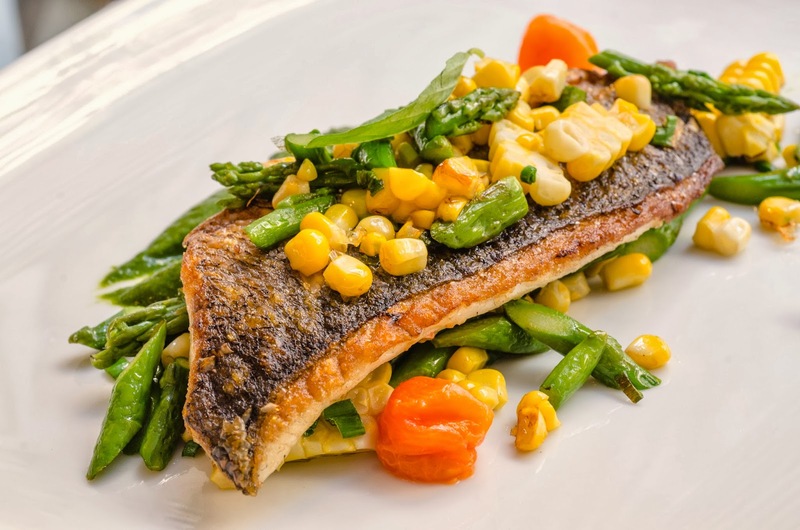 I love tender, fleshy branzino, the silvery type of seabass, redolent of fresh summertime beaches--I usually order it whenever it's on a menu, whatever time of year. Try this dish of fish! I was reeled in by this recipe of Branzino in Padella courtesy of Patrizio d'Andrea from the Dopo East restaurant in Manhattan. seconds more. Transfer the fillets to a warm plate in an oven on low. Rinse and dry your pan, add the remaining olive oil along with the two garlic gloves. Dopo East is located at 345 East 62nd Street, DopoEast.com, 646-484-6548. This was so fun to make, so easy and actually pretty good! I happened to happen upon this recipe online and thought it would be a perfect host for our small Oscar Party. Baby always makes a ton of stock, so the chicken stock in our freezer was an easy acquisition and an ample substitute for the canned Progresso broth suggested in the recipe. A Mexican-flavored rotisserie chicken that we bought was quickly shredded and thrown into the mix--we also used a classic frozen vegetable medley (carrots, corn, green beans, peas), gladly relieved of the task of chopping fresh carrots and then having to further rip open a bag of frozen corn. We eschewed shallots and went for white onions instead, already chopped, to save more time and effort. Tostitos corn chips stepped in as our tortillas of choice and the black beans we used were vegetarian and fat-free. 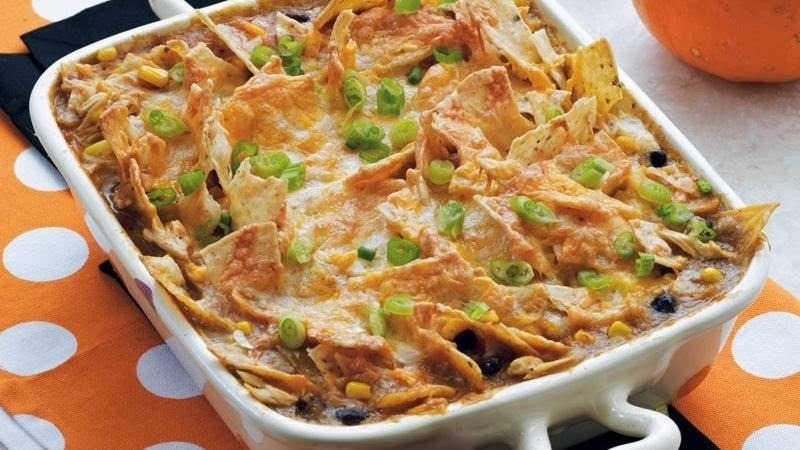 The sour cream topping was fat-free as well and we dotted the whole dish with chopped scallions, simmering into the Mexican cheese. Do check on this periodically as it bakes for about 20 minutes in your 375-degree oven, to make sure your cheese doesn't burn--and let it sit for about 10 minutes to cool down! Toasting Coronas with lime all around! Go to BettyCrocker.com for the complete recipe. 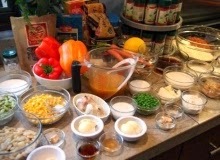 Thank you BettyCrocker.com for the photo!